What do a BlackBerry Priv, Galaxy S7 edge, Xiaomi Redmi Note 3, Alcatel Idol 4S, a Huawei P9, Honor 8, and an HTC 10 have in common? Well, they're all Android phones, of course, but they all lack a common feature: 'OK Google' hotword recognition while the screen is off (off the charger). In fact, this feature is so rarely found on Android devices that you can almost call it a Nexus (or soon, Pixel) exclusive these days. And even then, not all Nexus devices seem to be able to do it. The proper name for this feature is "always on." The reasons for 'always on' being disabled on so many other devices are seemingly myriad - some OEMs claim security issues, others have conflicting products (cough S Voice cough) with similar functionality, and some may be limited by the capabilities of their chipsets or a perceived potential for power drain. LG, though, has attempted to follow Google's lead on this rather handy feature (it worked on the G5 as well). 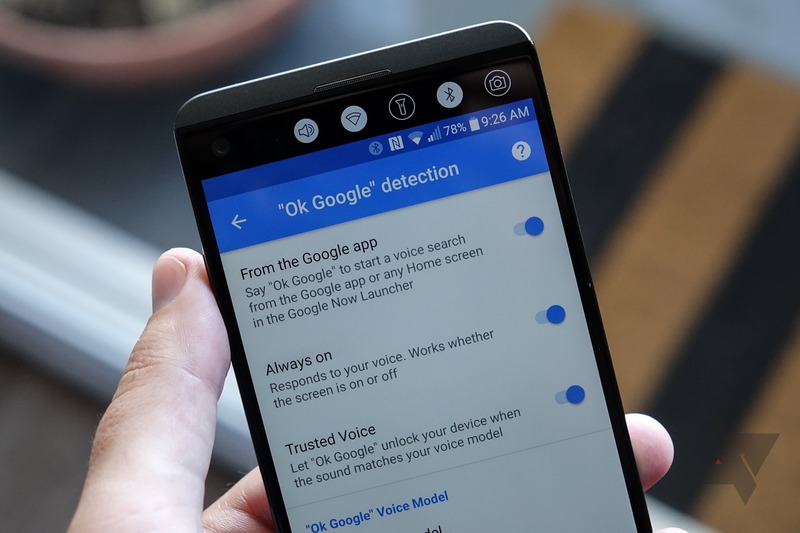 With Google Assistant and Home on the horizon, the importance of voice commands on your Android phone will likely be going up, not down, in the near future. As such, being able to activate those voice commands while the display is off is certainly going to be a desirable feature. Sure, not everybody uses voice commands, and I get that! But I regularly do, especially for timers, alarms, and reminders, and not having to actually reach for my phone and turn it on to use those commands is a serious convenience. It makes your phone feel more like a futuristic personal assistant and less like a handheld internet microphone. I didn't see many people point this out about the G5 earlier this year, and so when I saw it was still implemented on the V20 (running Nougat, a considerably feather in this phone's cap), I felt it was a good time for a reminder. So, good on you, LG, for doing what so many other manufacturers seem unable - or unwilling - to.